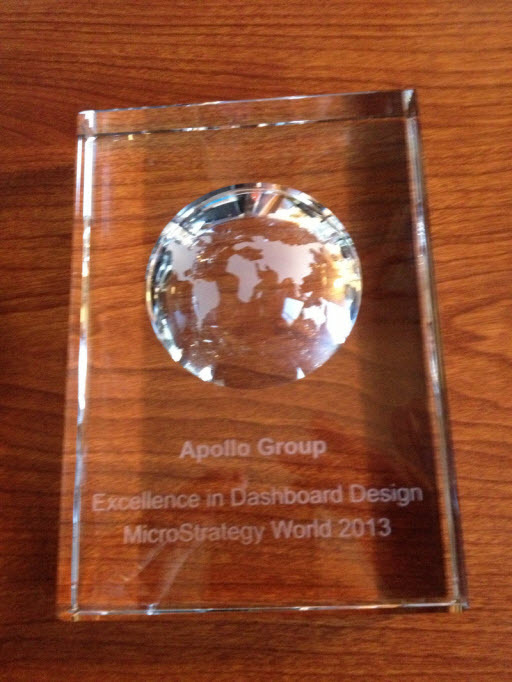 On Tuesday evening, January 29th, 2013, Apollo Group was bestowed the Excellence in Dashboard Design Award at MicroStrategy World 2013. Their entry, a Student Performance Dashboard, was based on portions of the top three entries in Stephen Few’s Dashboard Design Contest that was held last year. Unlike those entries in Stephen’s contest, which were designed in Photoshop and Excel, Apollo Group’s entry was design using MicroStrategy v9.2.1 and the Visualization SDK (Adobe Flash Builder Professional v4.0.1/Flex SDK v4.1). Apollo Group’s entry was one of the top 5 entries (no order given) based on 89 submissions; There were also several other entries that received Honorable Mention. My entry for the MicroStrategy World 2013 Dashboard Contest is a prototype of a Student Performance Dashboard. This dashboard will be part of a new suite of higher education products and services that collect and organize key operational and performance data that deliver actionable metrics and analytics. This new suite of products is known as Apollo’s Education-as-a-Service (EaaS) and is referred to as AES. The actual implementation of this dashboard would be used by faculty to show all of the student performance data, for a specific class, on a single screen with the goal for the instructor to immediately visually understand the key performance metrics and take action on them. Back in August of this year, Stephen Few, data visualization evangelist and author of the seminal book, Information Dashboard Design, announced a contest to design a dashboard following best practices and principles. The contest required participants to design the dashboard using student performance and assessment data that Stephen provided. Any graphic design tool (e.g., Photoshop, InDesign and Excel) or BI tool could be used to create the dashboard. To the best of my knowledge (and Stephen’s), none of the participants used MicroStrategy to create their dashboard. A few of the participants did use Tableau and SAS. This fact alone made me want to create an innovative dashboard to demonstrate the capabilities of MicroStrategy (Disclaimer: I am not an employee of MicroStrategy and chose to use this tool since it is our internal standard BI tool. I am not endorsing MicroStrategy or any other tool for the purpose of creating this dashboard). Each of the three winning designs contained elements the Apollo Group was interested in for our proposed Student Performance Dashboard for EaaS. I wanted to be able to incorporate elements from each of these winning dashboards into a single dashboard so that I had a prototype to show our internal business partners. In addition, I wanted to be able to demonstrate to them the capabilities of MicroStrategy. Stephen Few is using the examples from his contest in the second edition of his book, Information Dashboard Design, which should be out later this year. I have been a big fan of Mr. Few’s for many years and encourage you to purchase this book once it is published to see and read more in-depth insights on the dashboards created for his contest. I also highly encourage you to visit his blog at http://www.perceptualedge.com/. Below is a screenshot of our award-winning MicroStrategy version of this dashboard. I have also attached a PDF file of my summary overview of the dashboard that I submitted as part of my entry to MicroStrategy. Nice dashboard. I was curious which MicroStrategy product/tools you actually used to build this? Any suggestion on how to get started using MicroStrategy to build something like this? I used MicroStrategy v9.2.1 and the Visualization SDK which included Adobe Flash Builder Professional v4.0.1 and Adobe Flex SDK v4.1. That is all I used. I am working on a few interesting ones to post on the blog in the next few months.